Marcus Automotive, LLC was founded in 2008 to develop and manufacture innovative automotive interior products for the global Original Equipment Manufacturer (OEM) and automotive aftermarket industries. As the inventor of the original automotive-lighted interior sun visor currently seen in the majority of vehicles throughout the world, Konrad Marcus continues to invent and innovate revolutionary market leading products for both automotive and non-automotive applications. The Company has designed, developed and marketed new products and technologies which were introduced to the North American automotive market in 2013. 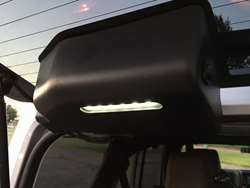 Marcus Automotive has developed a new interior sun and glare protection system for the premium automobile and sport utility segments. The product called Eklips™ creates a new standard for functionality and harmony within the sun protection category. Styling appeal, user-friendly ergonomic functions and enhanced vision in direct sunlight and night time are attributes that provide a better experience for the driver and passenger.